Accused of a Washington State DUI? 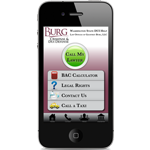 Call Burg DUI Defense Today! Accused of a Washington State DUI? Call us - DUI's are what we do! The DUIWashington.com site is devoted entirely to WA State Driving Under the Influence (DUIs). What to do after you have been arrested for drunk driving in Washington State. What the Washington State DUI laws are. What the Washington State DUI procedure is. What the Washington State DUI penalties are. Things you can do to help your Washington State case. Geoff Burg is an incredible lawyer. He is tenacious and skilled in the courtroom and he has a passion for the pursuit of justice. He has a reputation as one of the best trial lawyers in the state and I recommend him without hesitation. When you are looking for a DUI attorney in Washington State, experience is very important to make sure that all your rights are protected and that you get the best possible result for you case. We are two of the most experienced Washington State DUI / DWI attorneys. We have over 30 years of DUI experience, we have handled over 500 DUI cases, we have tried dozens of cases in counties all over the state - working in courts from Forks to Walla Walla. Most of our DUI cases are in King, Snohomish and Pierce Counties. DUIs are one of the most political crimes that there are. We are not only experienced in the courtroom, but are involved in many activities that helps us get great results for our clients. We both have worked extensively with the legislature to help reform Washington State DUI laws. Both of us speak at DUI conferences and publish articles for the state criminal defense organization. We have been elected to the two Washington State DUI organizations that require unanimous election to become a member. Finally, we were founding members of Citizens for Judicial Excellence, an organization that strives to elect the best judges in the State of Washington.